Simon Gibson at Worth Avenue Yachts sends news of a $2.4 million price drop on the 36.6m motor yacht Orinokia, a joint listing with Roberto Aboumrad at Performance Boats in Mexico. 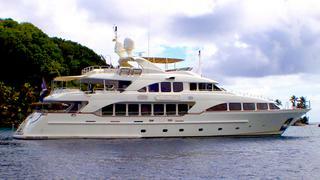 Built by Benetti in 2007 to ABS class, Orinokia is one of the yard’s popular Classic 120 series. She’s never been chartered and only lightly used by an experienced owner, with a rigorous programme of refits and upgrades. Accommodation is for up to 12 guests in five staterooms including an expansive full beam on-deck master suite. Orinokia is down from $12.3 million to $9.9 million.